The coming impact of telemedecine on the world’s poor. 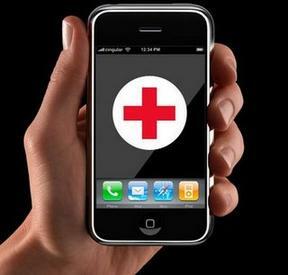 Mobile operators will deploy smartphone services as de facto healthcare for rural areas. How should they know? ARM just makes and licenses processor designs. Licensees incorporate them in complex chips (SOCs); the licensees’ customers incorporate the SOCs in gadgets; the gadgets are sold to final customers. It’s a long chain. But ARM’s business model requires it to keep abreast of these final markets, so it can steer its design programme. That’s why ARM puts a lot of effort into designs for the booming automotive market, and very little into the stagnant one for desktop PCs. The chances are they know what they are talking about. â€œSafaricom has employed a wide-network infrastructure across and there is therefore opportunity for us to layer on services that make a difference to the Mwananchi,â€ Safaricomâ€™s Enterprise Business General Manager, Sylvia Mulinge said in a recent statement. (Mwananchi is the Kiswahili word for â€œCommon manâ€ or â€œCitizen.â€) â€œWe have set up 800 digital villages and target to push the number to 5,000,â€ she said. In case you are worried that this is just feelgood PR, the telcos are into e-health for the money, like Adam Smith’s butchers and bakers. Health ministries even in Africa have budgets, and a major delivery problem; if e-health is value for money, they will pay for it. 800 digital clinics is not greenwashing. 5,000 will be major change. If this works in Kenya, it will be rapidly replicated. The mobile phone revolution in Africa has wirelessed the continent – with >700m subscriptions, probably 80% of Africans have access to a least a basic mobile phone. Smartphones and 3G networks are following (another ARM prediction is 64-bit smartphones for under $70). Current Internet penetration is 26% for Africa as a whole, with 51m Facebook accounts. The operators are parts of big multinational groups: Safaricom is 40% owned, and operationally controlled, by Vodafone. The company launched the mobile phone payment system M-Pesa in Kenya in 2007, and has now spread it to 10 countries, including India. M-Pesa has rivals, like this one sponsored by India’s Airtel operator. The mobile operators have found themselves in the unlikely position of being the first universal utility to reach half of the world’s population. They have already become de facto banks. If e-health takes off, they will become healthcare providers too. Safaricom’s digital clinics don’t quite match ARM’s prediction. The clinics will presumably piggyback on the high-quality microwave links the operators have set up to their cellphone towers, and there’s no mention of smartphones. But mobile telcos are run by IT types, with no preconceptions about the proper way to deliver health care, and a keen understanding of their own technology. Why not set up a Kenyan WebMD, in Swahili, Luo, Masai, and Kikuyu? A smartphone is a very capable multimedia communications device: it has a microphone you can link to a stethoscope; a camera you can link to visual probes; and wifi you can connect to a cheaply pre-equipped blood pressure or blood sugar monitor. That’s a lot of diagnostic kit already. This sort of health care was pioneered years ago in the days of radio in the sparsely populated Australian Outback, and more recently in the Canadian North. These are tiny niches in terms of the population covered. Telemedecine in the developing world is about to change the lives of billions of Mwananchi. ARM's lack of investment in the desktop market is not so much because the desktop market is stagnant, but because they've decided that from a business standpoint that the risk of failure is not worth the investment. I'm sure they would love to have the business if they knew they would have a high chance of success. Since ARM is not software-compatible (known as the ISA (instruction set architecture)) with Intel, they would have to convince MS to offer Windows in ARM-specific versions. Likewise with all the major software vendors. Absent an existing market, I would guess that these vendors would choose to do so only if ARM were to pay for the costs. They would also have to overcome user reluctance. As a user, the benefits of ARM would have to be really compelling. Otherwise, I'd be afraid that companies such as MS would drop support for my hardware next year. That's not to say that market trends are not a factor at all. If the desktop market were growing quickly, and the mobile market were shrinking quickly, it's true that ARM might feel desperate enough to go after the desktop market. But it would be tough. Plus the fact that Microsoft did offer an ARM version of Windows (RT) in the Surface supertablet, and it flopped because of poor compatibility with legacy applications. Something may turn up for ARM: Microsoft may make Windows 1x truly multiplatform, merging Windows Phone, which runs on ARM, with desktop Windows, which is X86; Google may turn Android or Chrome OS into a full-featured OS with a file manager, search, etc; one of the Linux packagers may come up with a really nice, smooth GUI; and (getting out of my depth) an ARM licensee may make an SOC powerful enough to run X86 Windows in an emulator fast enough for government work. I don't suppose it worries ARM much, unlike the very real struggle with Intel over servers. The desktop and laptop issue looms much larger for you and me, because we run PCs, than it does to ARM, which covers everything, and gets much of its license revenue from billions of tiny embedded chips. I wonder (assuming for a moment no intervening disasters, which is probably a mistake) whether some developing nations might not end up with a signficantly more effective health-care system than many rich nations, because they won't be hampered by existing infrastructure. The set of diagnostic tests you can run with a smartphone equipped with a couple of cheap lenses and LEDs is pretty amazing. And potentially much faster than the usual thing (in the US at least) of sending almost everything out and waiting for results. Interesting that both mobile payments and telehealth are being pioneered in Kenya, not say Egypt or India. Africans start from a lower technical and economic base, but have fewer preconceptions and less of a bureaucracy to enforce them. I would guess that the mobile telco engineers and managers in rural Africa (even in Somalia and the Eastern Congo) are also an exceptionally enterprising and resilient bunch. The Safaricom spokesperson quoted is an African woman. One non-story that did not get reported much was the extremely effective response in Nigeria to an Ebola case. Immediate lockdown, 100% contact tracing, bingo. Guinea-worm eradication too. Boko Haram is not all that's happening. "Fascinating reading. Sometimes "the market" really does produce astonishing good." When I was teaching at the University of Florida, I was an advisor to a master's student from India who wrote a paper on the impact of the IT industry on India's economy. Most of the effects, from her point of view, were on people outside the industry. The best example I recall: a village where a group of tech companies wired for high-speed Internet service and then an enterprising nurse opened a booth with a single good camera. Then an urban ophthalmologist gave poor villagers their first eye exams remotely.